Residential properties also demand reliable continuous power, especially large and remote homes. In fact, the further away properties are from the local network, the higher the likelihood of mains power failure and owners can reduce the risks of power failure by implementing their own standby power solution. As an example, a residential client of ours was concerned that, in the run-up to Christmas, any compromise to the mains power of their rural West-Sussex residence would jeopardise their Christmas plans and endanger the contents of their specialised aquarium. As well as being far from the local network and experiencing regular power cuts, falling trees were damaging power lines. With Christmas approaching and guests expected, the client’s power requirements would be further stretched by cooking and heating demands. On top of this, the client’s aquarium required 24/7 power. 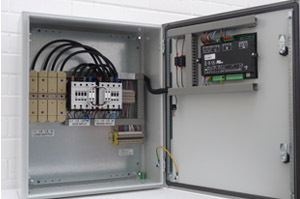 Working to a tight deadline, shentongroup provided a 33kVA generator with a 100A 3ph AMF Panel. With aesthetics in mind, shentongroup installed the generator and accompanying fuel tank on a pre-cast concrete slab, hidden by a sympathetically-designed brick wall. Another measure to hide the Generator system and to maintain the rural aesthetic of the property was running cabling through trenching. Suffice to say, shentongroup completed all work in time for the Christmas season, providing the client with a generator maintenance contract guaranteeing a 24-hour, seven-days-per-week emergency response service. You can read a full shentongroup case study on this project here. To learn more about the continuous power options for your residential property, click here to speak to a member of the UK’s leading technical experts in Standby Power, Uninterruptible Power Supplies and Combined Heat & Power Systems.